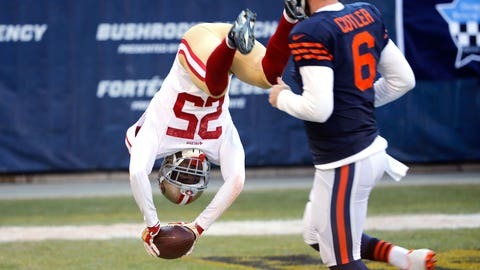 Bears quarterback Jay Cutler gave 49ers cornerback Jimmie Ward plenty of reason to celebrate. When the San Francisco 49ers finally snapped their season-long first-quarter touchdown drought in a Week 13 game against the Chicago Bears, they celebrated in style. Of course, it took the defense and cornerback Jimmie Ward to end the dry spell for the 49ers, who came into Sunday’s game averaging a league-worst 13.8 points per game. Ward stepped in front of Alshon Jeffery on an attempted wide receiver screen pass by Bears quarterback Jay Cutler at Chicago’s 29-yard line and raced down the sideline before launching himself into the end zone with a front flip. Although Ward failed to stick the landing, the 2014 first-round draft pick scored the first touchdown of his career on his very first interception.